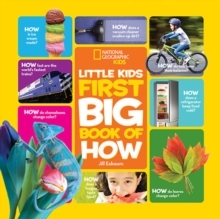 This charming reference book takes a closer look at the things that surround kids every day and how they work-from cars to vacuum cleaners, animal bodies to humans. More than 100 colourful photos are paired with age-appropriate text featuring answers to questions like "How do chameleons change colour?" "How do refrigerators stay cold?" and "How does my body heal?" This book inspires kids to be curious, ask questions, and explore the world around them.